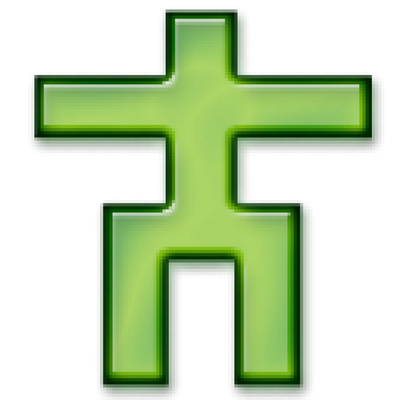 Hi everyone, my name is Mark Morris and I helped found Introversion Software back in 2001. We’ve made a few games in our time, however I’m delighted to say that our biggest accomplishment to date, Prison Architect, is coming to PS4 through a collaboration with the good people at Double Eleven! Prison Architect allows you to act as both architect and governor. You control every detail of your Prison — from building new cells and facilities to hiring staff and creating reform programs… all while dealing with informants, contraband smuggling, gang warfare, full scale riots, and a lot more! The idea came from a holiday in Alcatraz; my pal Chris Delay went on a tour of the infamous prison and when looking at the mechanisms and intricate systems in place, he was inspired and so Prison Architect was born. Public opinion is divided as to whether prisons are too harsh or not harsh enough, so we wanted to create a game where you could touch on that and explore it for yourself. The idea was to create a game where players had a chance to experience a simulated prison management system and leave every decision — big and small — to the player. The game began life as a crowdfunded project on PC and 5 years (and thirty something updates) later we released version 1.0! 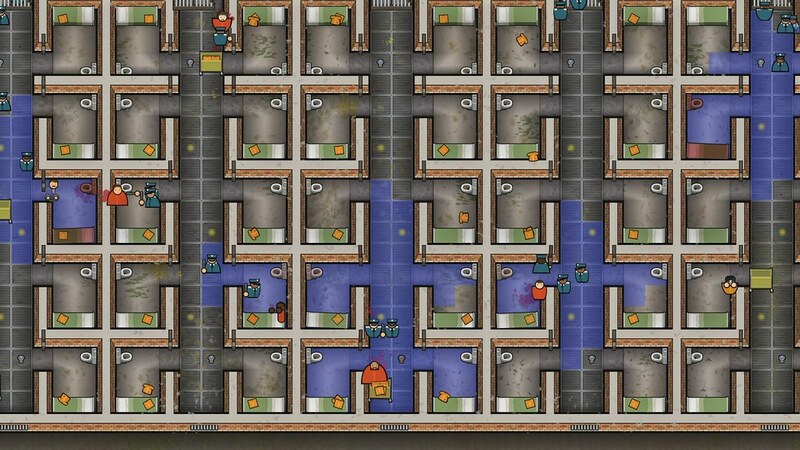 There was an overwhelming reaction to Prison Architect which made us consider bringing it to PlayStation. The team at Double Eleven approached us with their ideas for how to make the PS4 version and we were really excited about where they wanted to take it. Most people will start their journey into the world of Prison Architect by playing through the Prison Stories, the game’s main campaign. You’ll start by equipping a small prison with everything it needs and later move to being called up to deal with emergencies. You’ll quickly learn how to cope with blazing infernos, prison wide riots, demolition, and construction. Don’t worry though, you can build an armory containing tasers, guns, and other lethal weaponry to keep order! If you make it through all that unscathed, the Mayor will be ready to give you the reigns of a brand new prison development where you can build the prison of your dreams. Now it’s on you to decide whether you build and manage a prison that offers rehabilitation and peaceful coexistence or if you’d rather impose intentional harshness and strip away any notions of wellbeing and freedom. Be prepared to deal with the consequences! 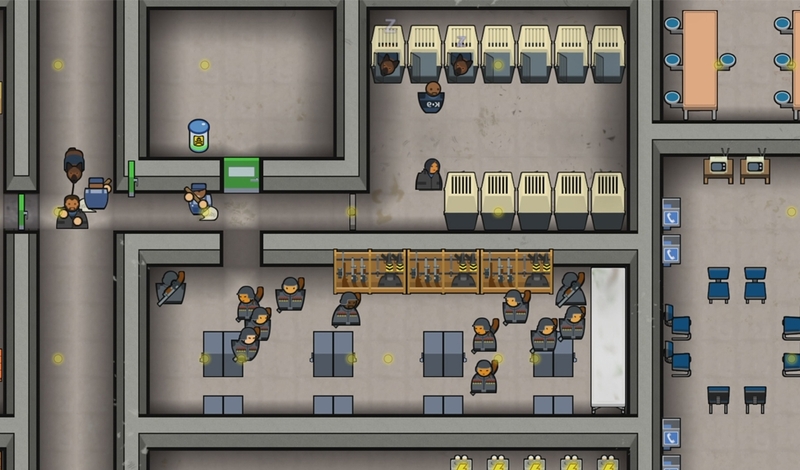 We’re planning to release Prison Architect on PS4 this spring. Thanks everyone! I’m Gaz, the games Design Manager at Double 11 Ltd in the UK. I’m here to answer your questions on this blog. 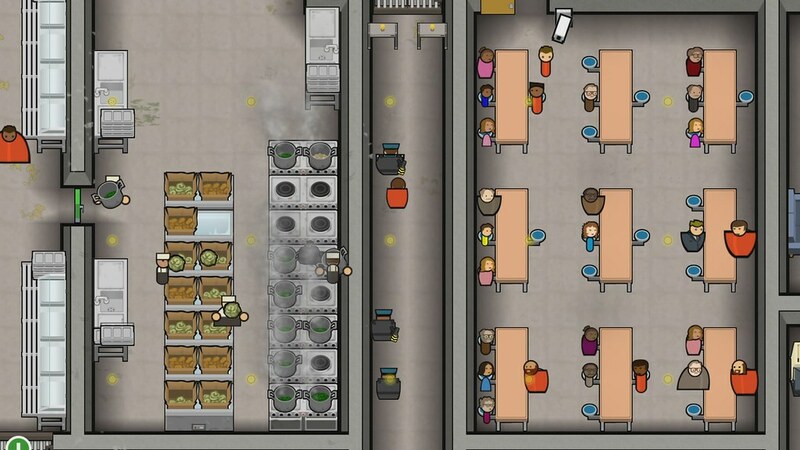 Myself and my team are hard at work creating the very best Prison Architect experience for console, working closely with our friends at Introversion (the original creators of Prison Architect). Please also check out our cool new Prison Architect website http://www.prisonarchitect.double11.com for all the latest news, pics and trailers. We’ll be adding more and more content as we continue to develop Prison Architect. We are really proud of the site and I think it’ll be a great companion to the game. I hope you are as excited about Prison Architect as we are. What the heck is a Vita? Interesting game concept. Looks like a fun game. Hi – quick question please – played this a lot on PC since Alpha 6 – however always got most out of a simple sandbox, infinite money, just-for-fun mode. Tell me I can still do this and you’ve got a sale ! Hope to see it coming to ps vita. Btw will Prison Architect have platinum trophy? 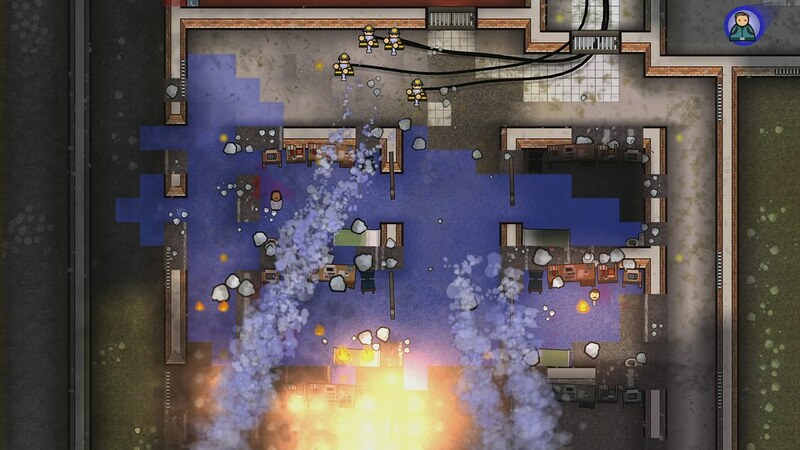 While everyone at Double Eleven has mad love for Vita, we are only creating Prison Architect for PS4. Hi. Will this release be the same as the full release version currently on PC or will we getting a stream of updates later? Also, Platinum trophy? We spent a lot of time designing our console editions with our friends at Introversion (the original creators of Prison Architect), including what content we would carry across from their PC version. Believe it or not, it doesn’t start with let’s take everything they did and decide what to remove. We looked at our new edition with a fresh pair of eyes as someone playing the game on console would, and said what would make THAT version great. So, certain and more recent features in the PC version may not be included in the console version, at this time. I can confirm there will of course be a full Trophy list, including a Platinum. There’s a lot of content in the console game both new and existing; from construction and contraband to gang fights and fires, from escapes and executions to rehab to riots… Needless to say what we’ve chosen to include lends to more than enough to make a great game and our focus was to make a great experience on console, along with new console UI, controls, cameras, and more. We wanted players to be able to share and play prisons inside the game so we’re creating World of Wardens. Similarly, we wanted to have some Prisons people could get into right away and get familiar with what the game has to offer so we created Warden Mode. There’s also a lot of new work we are putting into gameplay, presentation and overall player experience as we continue development. I discovered this game in a forum thread and have been wanting to play it ever since. This news makes me very happy. That is all. Man, and I came here thinking about how slick it’d be to play a management game like this on the Vita. Shame! I hope Prison Architect can come to the PS Vita in the future! I understand that no one wants a “straight port” from PC for PS3/4/Vita. I appreciate the effort put into figuring out how to make best use of the DualShock/Vita motion/touch controls, and make things look good on a large 1080p display. Will the game get regular improvements from the Steam version, when they are appropriate for console? I’ve been disappointed that Nom Nom Galaxy on PS4 still hasn’t gotten the improved tutorial and other improvements from the Steam version. Is that update in the pipeline? I was waiting for a PS4 version to start back playing that game. I just hope that the Ps4 version will respect the original game design and not become a dumbed down version for “non-pc” console players. I understand that you have to change things (UI / Controls), but I sincerelly hope it’s still basically the same game. In regards to Prison Architect, this is something we’d surely love to do but it does of course come down to time and demand after launch. As you say we would first look at the content that is appropriate/ready against the fan’s desire for it. Yeah we totally respect the original game and are working closely with Introversion on design decisions. I myself was a big fan and original backer of the PC game. This is a real project of passion for me and my team so you’re in good hands ;-). When we mention ‘console-friendly’ for us that doesn’t mean dumbing anything down, but enhancing what’s there, perhaps with a bit of extra guidance or messaging to the player, and little extras on top that all gamers will appreciate. I think a fan like yourself will really enjoy some of the nuances we’ve added. One example (looking at the very latest thing just gone in to the game this second) is the ability to camera-over to an inmate’s cell from his Bio, perhaps to allow you to then search his premises or perhaps upgrade his cell with more luxuries. I was an early backer of the PC version of this (before we were called backers) and never played it! LOL I much prefer gaming on the PS4 so I expect I’ll be picking this version up! Great to hear Dragonchasers and thanks for the love. I’m very interested to see how this will work. I play this game on the computer a lot, The platinum trophy is very tempting though. Any word on if there’ll be a demo. I’d want to try it out on the PS4 before buying it to see how the controls work. No word on a demo at this stage. I can tell you that the UI and Controls, and how they gel together have been one of major focuses throughout development. We continue to fine-tune this area of the game to ensure its as user-friendly as possible and that the thing you want to do or build is within a couple of buttons presses away. Was just wondering if the “names in game” will be carried over from pc i absolutely love this game..
And i did get one of those fancy characters and all that. If i buy ps4 version will i be there as well??? I love this game have been looking forward to it comming out on the ps4 but I have some questions I hope somebody can awnser. Is ps4 version going to have all the features it has on the pc and if not witch features are going to be deleted? Is the price going to be the same? I can not wait to get my hands on this. Any chance this would come out as a retail release? Maybe a limited supply?